Pneumatic tools are powered by compressed air. Common types of these air-powered hand tools that are used in industry include buffers, nailing and stapling guns, grinders, drills, jack hammers, chipping hammers, riveting guns, sanders and wrenches. Review the manufacturer's instruction before using a tool. Wear safety glasses or a face shield and, where necessary, safety shoes or boots and hearing protection. Post warning signs where pneumatic tools are used. Set up screens or shields in areas where nearby workers may be exposed to flying fragments, chips, dust, and excessive noise. 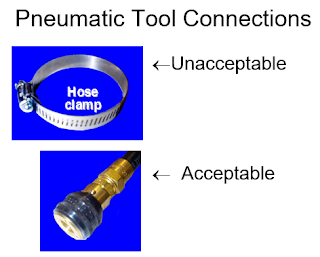 Secure pneumatic power tools to the hose by some positive means to prevent the tool from becoming accidentally disconnected. Safety clips or retainers shall be securely installed and maintained on pneumatic impact tools to prevent attachments from being accidentally expelled.